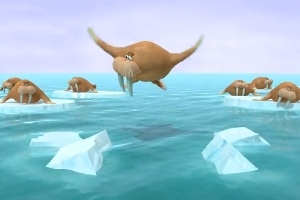 A walrus takes flight to deal with global warming. Image: Monterey Bay Aquarium. The Monterey Bay Aquarium has a fun new video about climate change, called Change for the Ocean, to go with their exhibit Hot Pink Flamingos. Narrated by John Cleese and produced by Free Range Studios, the animated video is cute, funny, and pretty effective at conveying the fact that people can change their ways much faster than sea life can adapt to climate change. Though their point is that human behavior can change quickly while animal evolution happens more slowly, the video shows some pretty fast animal evolution. Flamingos grow longer legs in a matter of seconds, and walruses instantly and miraculously modify their flippers into wings. If you weren’t listening to John Cleese as he says “Sadly, animals evolve far too slowly,” you might just get the wrong idea about how evolution works. Evolution is generally a slow process. But, as humans can ride bikes to work instead of driving in cars, animals can make behavioral changes in response to climate change, too. Some animals spend more time in the shade, or move to cooler habitats. Others do more than just relocate themselves. In response to the heat, the Arabian oryx, a species of antelope, becomes less active during the day, when it’s hot, and more active at night, when it’s cooler. Other animals, through changes in their behavior, can actually change their physiological response to high temperatures The intertidal sea star Pisaster ochraceus takes up cold water into a cavity in the middle of the body—and this mass of cold water keeps its body cool during low tide. Scientists at the Bodega Marine Lab found that sea stars take up extra water when conditions are hot, and can thus maintain their body temperature. These kinds of changes are not evolution in action—rather, these animals are modifying their behavior to deal with the heat. Like the animals, we humans can change our behavior to deal with a warming world. But we have a second option, which the animals don’t have: we can change our behavior—in big ways—to prevent the world from getting quite so warm in the first place.